When I decided to review the Rough Rider Bartenders, I quickly realized that a review of three knives was turning into a history of the pattern. As most people are probably more interested in just a review of the knives, I decided to move the background of the pattern to a separate page. For more on the history of the bartender pattern, you can look here. I’m just going to review the Rough Rider Bartender’s here. So what exactly has Rough Rider done? The Rough Rider Bartender knife is based on the Case Pattern 130. The knife has four blades including a spear master, pen, label cutter and corkscrew. Currently, Rough Rider offers the knife in three different styles. The knives are all part of the Support the Cause program; a charity of Smoky Mountain Knife Works which supports the University of Tennessee. Part of the proceeds of the sales from the Support the Cause programs goes to support research programs investigating treatment and cures for Heart Disease, Breast Cancer, and Prostate Cancer. All three knives are well made with very tight springs. This may translate to “nail breaker” for some people. From what I can tell, this pattern of Bartender has only been produced by three companies. W.R. Case & Sons produced the original. The other two companies known to have made this specific pattern are U.S. Classics and Rough Rider. The U.S. Classic features a “bottle” shaped shield and plain bolsters. The Rough Riders feature the shield for the specific “Support the Cause” charity. All three Rough Riders have smooth bone scales; red for heart disease, blue for prostate cancer, and pink for breast cancer. All three knives sport the typical single ring bolster that seems a common trait of almost the entire line of Rough Rider knives. The main spear on each knife, has a “Support the Cause” the cause blade etch which matches the scale color. There is no blade wobble and the springs hold the blades in place. The cork screw lock in the 90 degree position but it will go past 90 degrees when required. This is NOT a defect in the knife. The cork screw should go past 90 degrees. 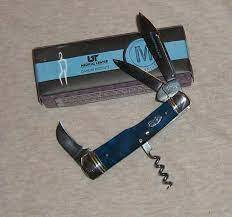 The corkscrew needs this give in order to allow the user to work the cork out of the wine bottle. As mentioned the blades are very tight and the knives have strong springs. The main spear, being the longest blade, is the easiest to open and has good snap. The label cutting blade closes with good snap but being short doesn’t have a loud snap when opened. All blades open smoothly but will take a little effort . I have had family and friends who have been directly affected by all of the diseases in the Support the Cause series so I had no problem buying these knives knowing that a portion of the proceeds goes to finding cure for these diseases. While the Bartenders run a few dollars more than other Rough Rider don’t assume the price was inflated because of the charities. Several other knives in the Support the Cause series go for the same price as any other Rough Rider of the same pattern. You can assume if Rough Rider offers a Bartender not in the Support the Cause line, it will be about the same price, if not the same price. When comparing the price to the U.S. Classic bartender, which is essentially the same knife made in the same factory, the Rough Rider Bartenders list at a lower price. Overall , I’m very pleased with these knives which explains why I bought all three. The Rough Riders are faithful to the “bartender jack knife” introduced by Case. My only real complaint is that it is “too faithful.” I really wish Rough Rider would have improved on the Case Bartender by replacing the secondary pen blade with a cap lifter. In my considered opinion The small pen blade really serves no useful purpose on this or many other bartenders of this pattern. A cap lifter would be much more useful. The lack of cap lifter on a bartender knife had been remedied long ago. Why Case did not include one its bartender is beyond me. Why Rough Rider copied Case’s oversight is also baffling. But in the end, it is an excellent knife with terrific lines. It will look great in any collection of bartender knives and at the $15 price tag you can get all three and still have money left over, compared to the price of one made by Case will cost you. They are a steal at $15. Finally, if you're not into the Bartender knives, then look for some other pattern of knife in the Support the Cause line of knives. You'll end up with a great little knife and help fight some of the most dreaded diseases known to mankind. You really can't go wrong! Description: The pink bone differs on both sides. In the case of my knife, there is a lot of white showing on the obverse scale (see picture). I have few other pink lemonade knives where the coloration isn't as vareid. Either way, this on looks pretty cool, especially in person. Packaging: Pink Lemonade UT Breast Cancer Traybox. Description: Very nice, almost translucent blue smooth bone. The knife would look great displayed along with the "Blue Moon" series as the dye is the same. Packaging: Blue "Man" UT Prostate Cancer Tray Box. Description:As many people know, I'm not crazy about red bone and typically when I pick up all of certain pattern, the red one is the last for me to buy. The red is very solid on the knife and like most of Rough Rider's red bone, it just isn't red enough or dark enough to suit my taste. Still it is for a good cause. Click the image for more information background information on Bartender knives.